Science fiction has always been about the exploring contemporary, sociopolitical, and philosophical issues within a futuristic setting. Nowadays when most people think sci-fi, they think of big explosions and/or monsters devoid of any real meaning. That's why it's refreshing to see a movie like COHERENCE trying to tackle some serious philosophical and existential issues in one of the most intimate settings of a movie; a single house. The movie takes place over the course of an evening where a group of eight friends get together for a fancy diner party to catch up. All of them bring a certain type of baggage that you would come to expect from old friends. There are passive aggressive remarks, unfinished business, and all around awkwardness that is bound to come up whenever dealing with a large group of people. The strength of the movie lies in these relationships which the film expertly establishes within the first 15 minutes. The movie does end up centering around Emily Foxler's Em as a dancer with some issues of regret. In fact, she's not the only one. Just about everyone of the people in the dinner party struggle with regret in one shape or form. What gets the movie going is the comet that can be seen shooting across the sky. It has been causing issues with the electronics nearby, such as phone screens cracking for no reason, and the power suddenly going out. We are then told of the story of previous comets flying near earth and strange effects that it has had on people in the past. And sure enough, this is when things start getting strange. There have been comparisons of this movie to PRIMER, and while that's not entirely wrong, it doesn't do COHERENCE justice. Whereas PRIMER focused more on the scientific aspect of the consequences of time travel all while showing the deterioration of a friendship, COHERENCE wants to explore more of the emotional and psychological effect of alternate realities and how that plays into your choices and how it makes you reevaluate your life. The thesis of the movie appears to be that the same group of people can react in a vastly different manners when a few subtle factors are changed, and its fascinating seeing all of the alternate paths that people could take at any given point. Once the characters in the movie start to understand what is happening and who the mysterious figures outside might be, the movie picks up and rarely lets your mind rest to keep track of what is going on. COHERENCE is definitely a movie that would reward multiple viewing if only so you can take notes to make sure you understand the intricacies. And while the complexity of the story is a personal draw, there are some very real emotional payoff here within the various relationships, and especially that of Em with her boyfriend, Kevin. COHERENCE uses some fancy theoretical psychics to try to get to the core of some very emotional and un-scientific human issues such as trust, regret, and courage and doing so elevates the movie to one of the best sci-fi movies of this year. 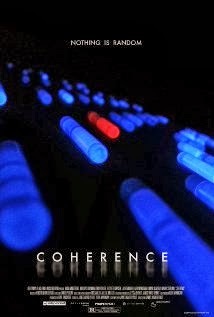 COHERENCE plays again during Fantastic Fest on Monday September 23rd, at 2:05 pm.